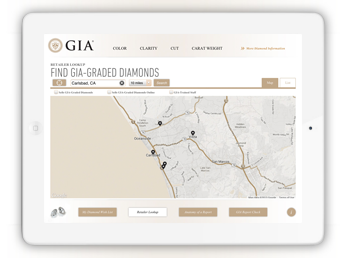 GIA’s 4Cs app for consumers will feature a Retailer Lookup, which helps customers to find your store by entering a zip code or using a geo-locator feature on their iPhone, iPad, or Android device. The Retailer Lookup is a free listing service. Who is this Retailer Lookup for? The listing service is for any retailer who offers GIA graded diamonds, or has GIA-trained sales associates on staff. How do companies register for the Retailer Lookup? Click the "List My Store" link found at the top of every page on https://retailer.gia.edu/ to open the Retailer Lookup Form. You will be asked to provide your store and contact information as you would like it to appear and accept the terms of participation. How do I list multiple stores? Retailers with multiple locations can download the Multiple Store Submission Form and email to retailersupport@gia.edu. Alternatively, companies can fill out the online form for each store location. How do I update my store listing information? To update your store information, please email your edits to retailersupport@gia.edu. We will send you a confirmation email once all edits have been made. What does it cost to participate? Nothing. The listing service is free.